"gaucho." YourDictionary, n.d. Web. 12 April 2019. <https://www.yourdictionary.com/GAUCHO>. A cowboy of the South American pampas. gauchos Calf-length pants with flared legs. From Spanish gaucho, from Andalusi. Instead of stressing yourself out over an entirely new style, shop for suits that encompass looks you might already be rocking, like a pair of gaucho pants paired with a fitted jacket, or a tuxedo-style pant suit for a fancier event. The Gaucho Pants Suit: Pant suits can seem unyielding, awkward, and uncomfortable if you aren't used to wearing them regularly. 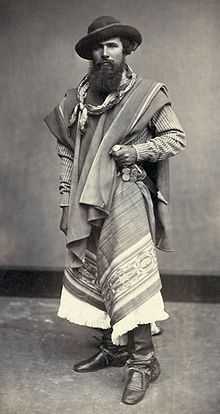 However, the gaucho influences of life in the Mexican West are reflected in the costumes and choreogaphy. Dressing-Up Tip: Gaucho pants can be really tricky, especially when you're picking out footwear. In 1816 the Spanish general Laserna, having been appointed commander-inchief of Upper Peru, made an attempt to invade the Argentine provinces, intending to march on Buenos Aires, but he was completely foiled in this by the activity of the irregular gaucho troops of Salta and Jujuy, and was forced to retire.